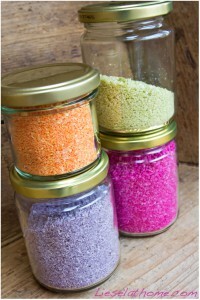 About a year ago I posted a recipe for how to make pink coconut sprinkles – coloring shredded coconut with beetroot. Ever since then I always have a jar of these in my cupboard and I use them a lot. Lately I have been thinking that it must be possible to color the coconut equally naturally, into other colors as well and so I started experimenting. 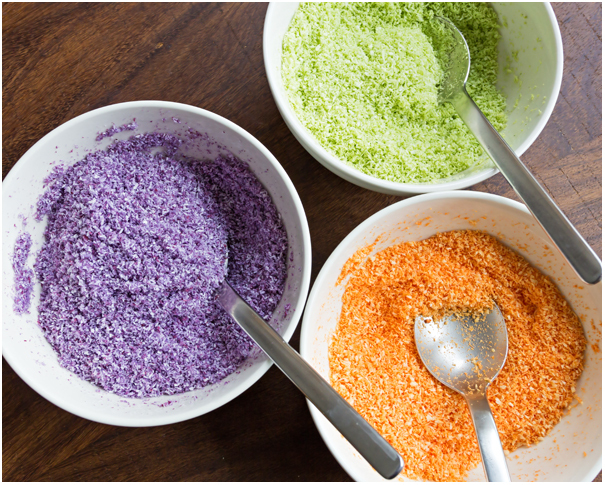 Here is the result: Green, orange and purple coconut sprinkles – in addition to the pink ones. 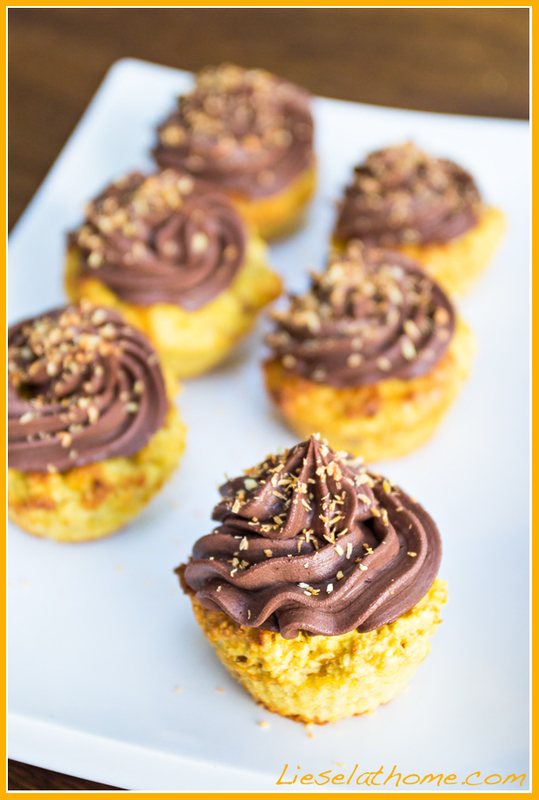 Read on to find out how easy this is to make! The naturally colored coconut sprinkles are perfect to give the finishing touch to a dessert, to top off cupcakes, to sprinkle over yogurt or to use instead of normal white shredded coconut for rolling chocolate truffles in. Mix well and spread out to dry in room temperature – which takes about 24 hours. 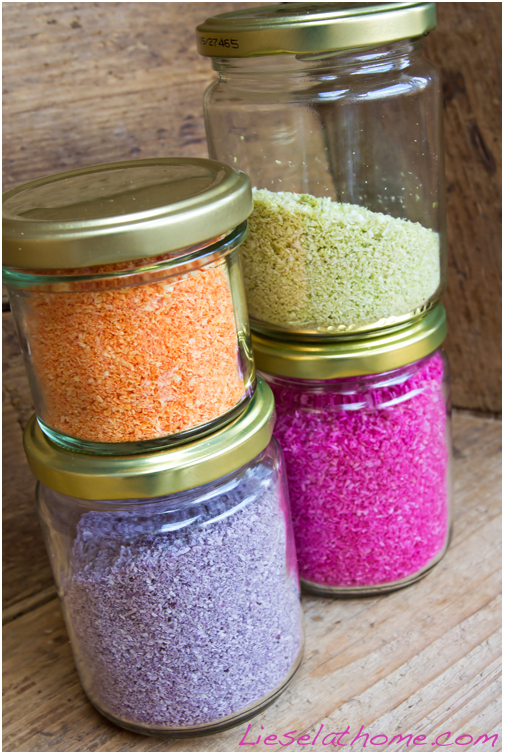 Once the colored coconut is completely dry – store in a jar with a lid – and use as much as you can to bring some fun colors into the kitchen. I used an old package of saffron threads that had passed the best before date about a year ago (OK two years ago – not sure how I could let this happen…). I had bought them cheap, but quickly found that the quality was low. Pretty tasteless and gave no color in my baking which is why they were left at the back of my cupboard. But now, I emptied the package into a small bowl and poured about 2 tbsp. boiling water over them. And voila – within no time the fluid was bright orange! 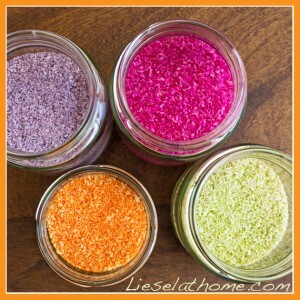 I used the fluid (without threads) to color about 150 ml dry shredded coconut. Just mix in a bowl, spread out and leave to dry – which takes about 24 hours or a bit more. Stir every now and then. 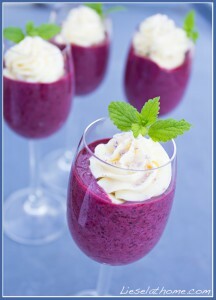 I used frozen spinach – 4 small blocks – and a few tbsp. boiling water. Mix in a blender until sloshy green. Then drain through a tea strainer to get the green fluid without the spinach pieces. Again – I mixed about 2 tbsp. green fluid with 150 ml dry shredded coconut, spread it out and left it to dry for about 24 hours – occasionally stirring. I was expecting a more red-purple but this is what makes experimenting so much fun – you never really know! For this color I had a scoop of frozen blueberries. 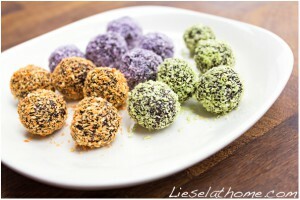 Let them thaw in a small bowl, and add 2-3 tbsp. boiling water. Mash with a spoon until fluid is a strong color and then mix about 2 tbsp. of the fluid with 150 ml dry shredded coconut. Leave to dry for about 24 hours – occasionally stirring. Mix in a blender and pour into glasses. (This was enough for 5 sherry glasses). Leave to swell in the fridge for at least 40 minutes. 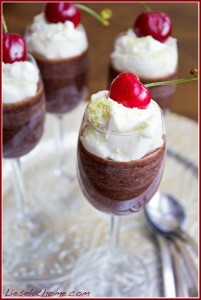 The topping is mascarpone mixed with honey and lemon juice. Can not say exact amounts since my son mixed it – but add lemon and honey for taste.